nthony Aranda as Innkeeper, Rachael Richman as Aldonza, Edward Hightower as Quixote, Dave Leon as Sancho. All photos by Jay Yamada. Rachael Richman, Paul Hogarth, Kimberley Cohan (rear), Jack O’Reilly, Mauricio Suarez, Emily Jeanes (rear). Mauricio Suarez, James Grady (rear), Jack O’Reilly, Emma Onasch, Shelby Stewart, Paul Hogarth. As a genre, traditional American musicals have mostly been designed for the big houses and big stages of Broadway. Perhaps someone could write a book on what musicals can best be produced in small venues or what criteria allow the compression to work. In “The Man of La Mancha,” the central figure’s fantasies represent sweeping adventures that could demand grand staging. But before its Broadway debut, the musical played at smaller theaters. Even on arrival at The Great White Way, it was produced with a single set – a dungeon. 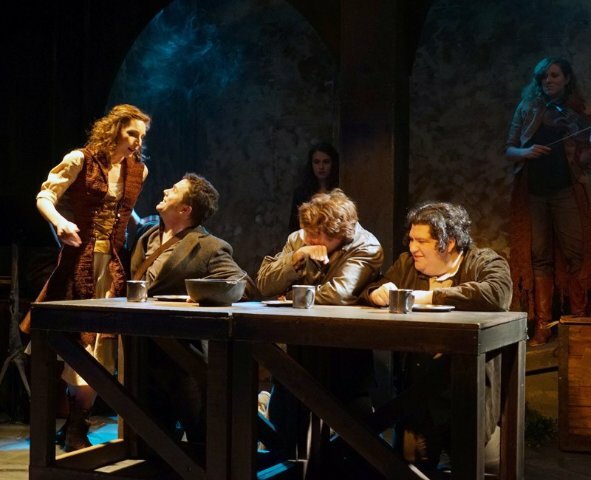 Other locations for the play’s action were styled by changes in lighting, movement of props, and the audience’s imagination. 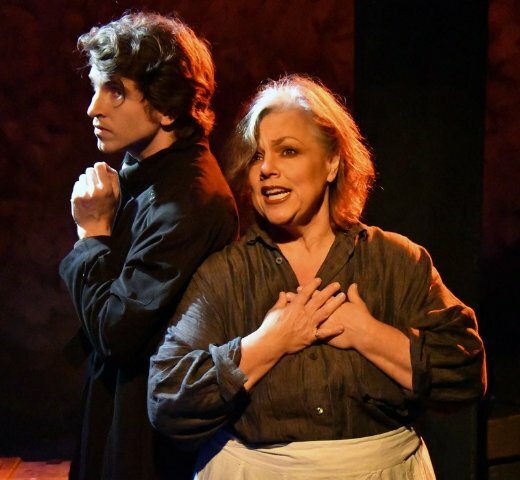 So the transfer of this big, yet small, production to Custom Made Theatre’s intimate space is not only a sensible artistic decision, but the outcome is a winning one. The musical is based on Miguel de Cervantes’ classic novel “Don Quixote.” But the musical is designed as a play-within-a-play with Cervantes himself as the initiating character. In real life, the author suffered a troubled existence and was imprisoned several times by the Inquisition. So the launch point for “The Man of La Mancha” is grounded in fact. Incarcerated with his manservant and a trunk full of possessions, the other prisoners in the dungeon are set to divide up the booty after a mock trial but agree to desist if Cervantes can provide a satisfactory defense. The author’s defense will be a play in which the prisoners act as characters. As the fantasy unfolds, we meet Don Quixote, played with complete command by Edward Hightower. Rarely does a fictional character have a word derived from his name, but what better describes our “Knight of the Woeful Countenance” than quixotic. Hightower soars with serio-comic flair as the idealistic, visionary, and starry-eyed dreamer, blithely stumbling from one episode to another with a sense of conviction above the riff raff that surrounds him. He vanquishes foes of truth and righteousness by jousting with windmills and the “Knight of the Mirrors.” He protects and courts the reluctant prostitute Aldonza, deluded in believing that she is the pure damsel Dulcinea. Don Quixote is accompanied by his faithful servant, Sancho Panza, played with great gusto and wry humor by Dave Leon. Unlike his master, he is well grounded, forever dealing with his master’s imprudence, often enduring unfavorable consequences without sharing the glory. Director Brian Katz’s production team has fashioned ambiance that suits the subject matter to a T. Defined simply by existing columns and a constructed ramp along the backdrop of the stage, Daniel Bilodeau’s skeletal set embodies the sense of an underground prison, while Maxx Kurzunski’s low lighting captures the dank atmosphere of a claustrophobic cave. Katz utilizes the stage wisely, distributing clusters of players over its full breadth. 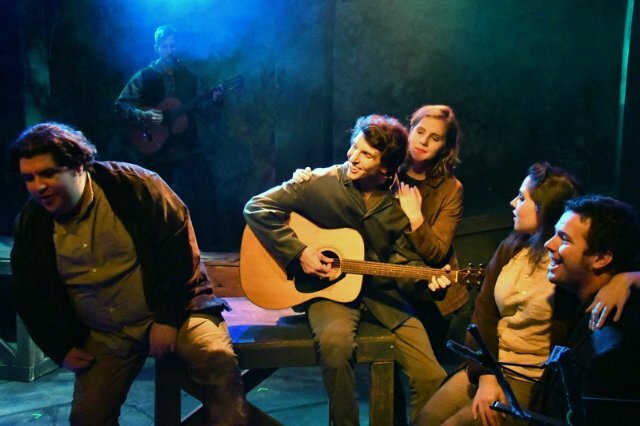 The score has been pared down for this production, but what a score – full of beautiful melodies and lyrics that gracefully reveal the story’s underlying themes. Most prominent is “The Impossible Dream” which has become a pop standard, symbolizing hope and the need for fortitude in the face of adversity. “I, Don Quixote” and “Dulcinea” lead the remaining list of compelling and charming songs. The actors perform as musicians, carrying out Mark Dietrich and Brian Allan Hobbs delightful arrangements with simple acoustic instrumentation. The adept use of hand-held percussion and guitars creates a very Spanish feel to the music. Opening nights can be hazardous. Although the audience may often miss glitches on the technical side, flubbed lines are usually more conspicuous, and there were a number of them. Acting and singing in the support parts was generally serviceable but uneven. Some may improve in subsequent performances. One consequence of having the actors as musicians spread widely on the stage is that the instrumental sound toward the centerline of the house is nicely stereophonic, but to the sides it is unbalanced. As a result, harmonic support lines can often overpower the melody for the patrons on the wings. All of that said, this is a delightful production that even the blasé who feel they don’t need to see this show again should enjoy. Don’t be embarrassed if you leave humming one of the wonderful tunes. 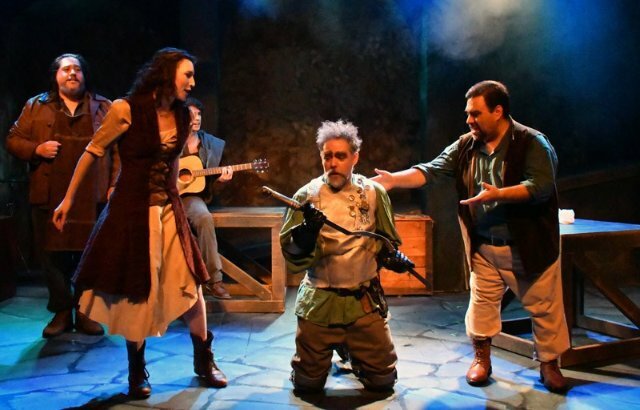 “The Man of La Mancha,” music by Mitch Leigh, lyrics by Joe Darion, and book by Dale Wasserman, is produced by Custom Made Theatre and plays on its stage at 533 Sutter St., San Francisco, CA through February 17, 2018. Reposted courtesy of For All Events.